At Stamps.com we’re always looking for ways to help our customers maximize their savings. That’s why we’re introducing a new pricing program called MaxSaver! Thanks to our partner, Intuiship, we’re able to offer you substantial savings when shipping Priority Mail packages that meet MaxSaver requirements. and less than 20 lbs. MaxSaver is a new Stamps.com volume-based pricing program designed to help our customers save a ton on shipping. With MaxSaver, shippers get deeper discounts depending on the size of the package. What packages qualify? If your packages are less than half a cubic foot in overall volume and less than 20 lbs, you automatically qualify. 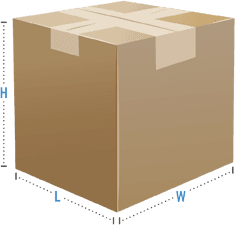 If you ship a 7″ × 7″ × 7″ Priority Mail box that weights 7 lbs. to Zone 4 (Los Angeles to San Francisco), you’ll usually pay $9.46. But since the package qualifies for MaxSaver, you’ll only pay $7.20. That’s a 18% savings! Prices will vary depending on the box size and zone, but as long as the package qualifies you will save money. For MaxSaver pricing to work, all you have to do is enter the box dimensions (length, width, and height) into Stamps.com. MaxSaver will automatically give you the lowest rate possible! Get your MaxSaver rates now! Contact a Shipping Solutions Specialist at shippingsupport@stamps.com or call 877-782-6739 today.